FenSeg reports a 60 percent theft hike in insured cellphones alone as Brazilians increasingly opt to insure their smartphone. SÃO PAULO, BRAZIL – Data released by Brazil’s National Federation of Insurance Companies (FenSeg) this week shows that theft of insured mobile phones increased 64.6 percent in the country between 2015 and 2016. According to the entity, the number of stolen insured devices in Brazil grew from 118,135 in 2015 to 194,523 last year. 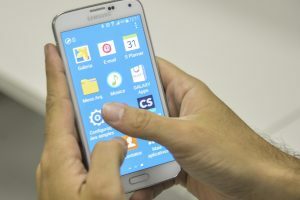 More Brazilians are insuring their mobile devices as the number of thefts increase, photo courtesy of Agencia Brasil. “The cell phone is portable, easy to hide, a valuable asset highly available, has a parallel market and is a status object. So it has all the features to make it a very attractive,” explained Tulio Kahn, security specialist and member of the Brazilian Forum of Public Security earlier this year. For Vanda Ferreira, whose cell phone was stolen in March of this year, in a busy São Paulo street, the loss of the equipment not only cut her off from reaching employers but also limited her access to news about friends and family. “At my house all we have are cell phones, no landlines, so without a phone I can’t get in touch with anyone,” she told The Rio Times. Ferreira was not only unable to reach people by phone, but was unable to access her social media pages, where she keeps tabs on her children who live in the Northeastern state of Bahia. “Without my phone, I had no way to access Facebook and didn’t speak to my daughters for almost three weeks,” she said. Like many lower-middle class Brazilians, Ferreira did not take out insurance on her old cellphone and had to wait weeks before having enough money to purchase a new one. Her new smartphone, however, has a one-year insurance plan, so if it is stolen she can get a replacement quickly. Ferreira is among a growing number of customers who have opted to insure their smartphone due to the high number of robberies of the equipment. According to FenSeg’s CEO Júlio Rosa cellphones today constitute a high-risk asset and as demand for this type of insurance grows the tendency is for the price to fall. “Insecurity is driving more demand for insurance,” Rosa told Agencia Brasil.